is probably without peer." Jonathan Marks, The Nation. Late night discussions with a Black Panther-to-be in the Paris of 1965 lead Jon Beckwith to make a decision in 1970 that estranges him from the scientific community. In 1974, Jon’s position as Professor at Harvard is threatened after he opposes Harvard’s genetic screening for the supposed “criminal chromosome” in baby boys. Subsequently, an encounter with “Scary Larry” in the midst of a desert sandstorm stimulates Jon Beckwith to wonder why the media’s portrayal of him has changed from scary to saintly. Now more accepted, Beckwith waits his turn to speak about eugenics while a scientific audience bursts into tears at the tale told by a Canadian woman who was sterilized against her will. Finally, a chance meeting on a train in France leads to an emotional reunion at a quail farm in Normandy with a former colleague believed murdered in Chile and stimulates Jon Beckwith to write his memoir. All these adventures and more are told in Beckwith’s book Making Genes, Making Waves: A Social Activist in Science. 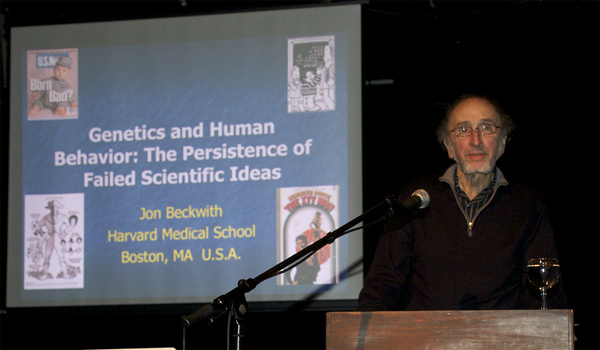 From the influence of the Beat Generation and scientists who were members of the World War II resistance movement to stays in Naples, Italy and Cuba, from the travails of J. Robert Oppenheimer to the Science Wars, Beckwith traces the roots of his rise to become a political activist within science. From early uncertainties to later inspiration on discovering the papers of a group of French scientists, he tells how he came to be a molecular biologist. The struggle to reconcile the political, humanistic and scientific threads in his life provides both a story of an individual’s change and the changes within science itself over the latter half of the 20th century.